Dr. Charles Cicchetti is a member of Pacific Economics Group, Inc. and the former Miller Chair of Government, Business and the Economy at the University of Southern California. (July 2012) Thanks for your enlightening editorial about the problems of feed-in tariffs for photovoltaic installations and the distortions they are causing in cost responsibilities among electric utility customers. While these issues are an immediate and growing concern, an entirely different set of problems will emerge over the next decade as the share of renewables in total generation approaches the high levels being dictated by most regulatory authorities. A growing wave of rooftop PV projects is starting to look ominous to some utilities. Will lawmakers accept utilities’ warnings at face value—or will they suspect they’re crying wolf? Keeping the lights on in a world of mushrooming solar rooftops requires several key technology and policy developments. During the 2012 EEI Annual Convention, panelists on a session titled “Distribution 2020: Implications of a Rapidly Evolving Distribution Grid,” offered several suggestions for managing the transition. Utilities sound the alarm as PV nears grid parity. 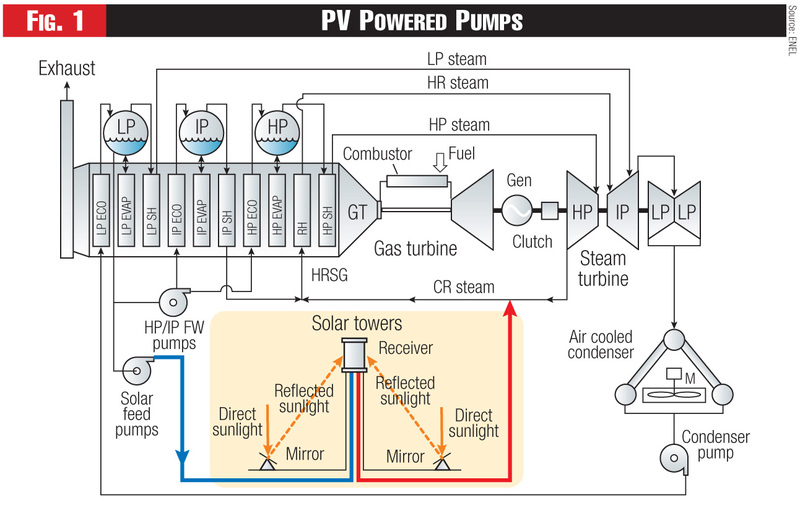 Utilities are testing options for adding solar capacity to existing steam power plants. 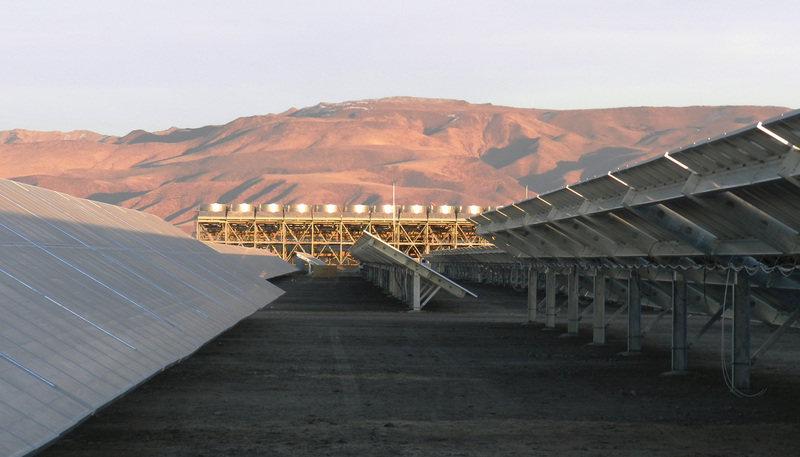 Concentrated solar thermal boosters increase plant efficiency and reduce emissions, while helping utilities to cost-effectively meet renewable mandates. 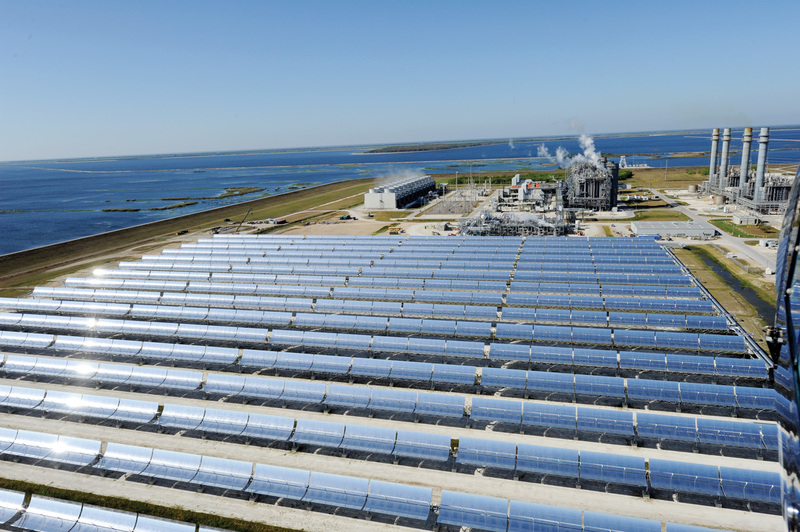 The first utility-scale solar hybrid in the United States was the 75-MW solar baseload addition to Florida Power & Light’s 3,705-MW Martin combined-cycle generating facility near Indiantown, Fla. The lead contractor was Rioglass America LLC. 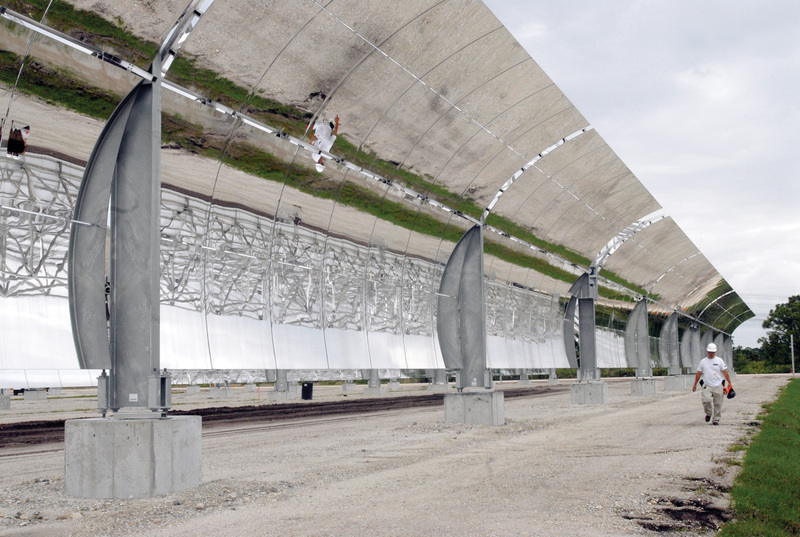 The solar unit, completed in 2010, includes 190,000 reflecting mirrors spread over 500 acres to concentrate light with basic parabolic, or trough concentrating technology, which is the most common type of concentrating solar installed in the United States. The $398 million hybrid addition was approved in advance under a 2008 state law approving the construction of 110 MW of renewable energy in the state, according to Buck Martinez, a senior director of development at the utility. FPL covered the costs with balance-sheet funding, buoyed by an $850 million 30-year bond issue last year. The Martin solar system has been ramping up production levels steadily. “Last month we hit 85 MW nominal, our highest production to date, and our goal is to get to 155,000 MWh in the near future,” says Martinez. Tucson Electric Power (TEP) recently opted to add a 5-MW solar peaker to its gas-fired 156-MW Unit IV at the Sundt Generating Station. 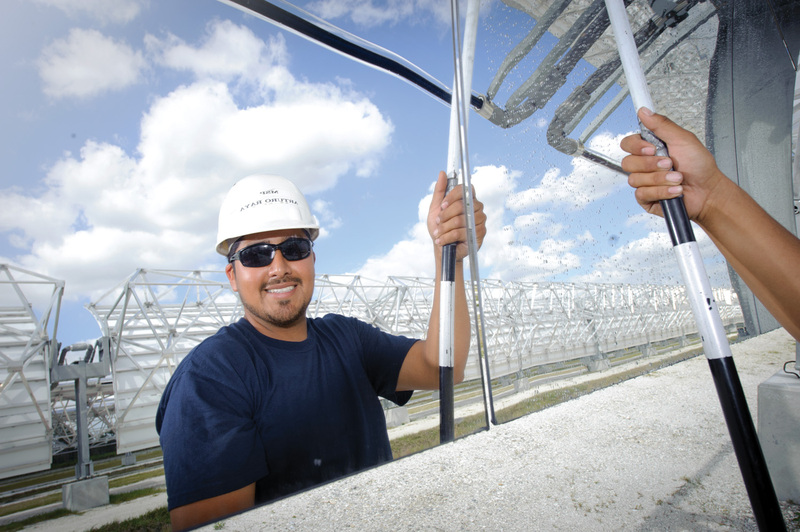 When it comes on line during first quarter of 2013, the solar facility will provide a 4-percent boost to the unit’s output. Areva Solar will provide linear Fresnel concentrating solar technology, which uses reflectors to heat a linear tube filled with water. Footprint was a consideration. “TEP also looked at a PV booster, and wanted to go larger, but 5-MW thermal was their limit because of land limitations on the metro outskirts of Tucson,” says John Robbins of Areva. The hybrid also will help TEP reach its goal of installing 200 MW of solar generation by 2014, which will allow it to meet Arizona’s 15-percent-by-2025 renewable energy standard. To pay for the development of the plant, TEP turned to its renewable energy surcharge collections from customers, which adds 0.7182 cents per metered kWh. 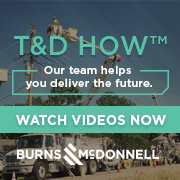 But once the plant is operating in early 2013, the utility will seek rate base compensation from the Arizona Corporation Commission, Barrios says. Xcel Energy in 2010 successfully tested a 2-MW, $4.5 million solar hybrid solution from Abengoa Solar, to boost efficiency by about 5 percent at its Cameo coal-fired plant near Grand Junction, Colo. The Cameo hybrid addition was approved in 2009 by the Colorado Public Utilities Commission, under an Innovative Clean Technology program. The first of its kind in the United States, the hybrid test was designed largely to help reduce emissions, according to Xcel spokesman Gabriel Romero. Overall, more than 500,000 pounds of coal were saved during the year-long test, and 2,000 tons of carbon dioxide emissions were avoided. The measured goal of the installation was simple. “If solar provides 20 percent of the fuel for steam production, then you reduce coal consumption by 20 percent and you reduce dioxide emissions by 20 percent,” says Bruce Kelly, a technical specialist at Abengoa. Thermal systems aren’t the only solar option for generators seeking to hybridize their power plants. Enel Green Power North America is building a 26-MW solar booster to complement its existing 33-MW binary-cycle, medium-enthalpy geothermal plant at Stillwater, Nev. The geothermal plant uses large-scale electric submersible pumps in the wells to pressurize and extract geothermal water. The pumps’ energy usage is partially offset by the 81,000 fixed polycrystalline-silicon PV panels, and excess generation will be sold to Las Vegas utility NV Energy under an 18-year power purchase agreement. Charles W. Thurston is a Fortnightly contributor based in Sonoma County, Calif.
Hybridizing fossil plants with solar thermal technology.